If there is one thing which we could all do with at the moment, I suspect that it is GOOD NEWS! It really does seem to be in short supply, and it is fair to say that the world longs for it. We want to be cheered up, we don’t want to be as we are. We know that something is wrong, and we wish there was a solution. There is, and His name is Jesus Christ, a mighty one who will save, as prophesied by Zephaniah. The Messiah, the one to save Israel from her sins, and not just Israel, but all humanity. In St Luke’s account, which we have just heard, John the Baptist preached the good news to the people (Lk 3:18) and the Good news is this: ‘His winnowing fork is in his hand, to clear his threshing floor and to gather the wheat into his barn, but the chaff he will burn with unquenchable fire.’ (Lk 3:17 ESV) What? I hear you say, this is GOOD news? It is. We have a choice to make: Do we want to follow Jesus or not? There is a choice of destinations after death: Heaven or Hell? Where do you want to go? Do you want to have a relationship with the God who loves you, who created you, and offers you salvation? This may seem stark, but it is part of Advent, to consider the four last things: Death, Judgement, Heaven, and Hell. We are able to make a choice. We are not simply consigned to Hell, to an eternity without God’s love and mercy, because of what God has done for us, through His Son, Jesus Christ, whose coming we celebrate. The Word became flesh, He shared our humanity, so that we might share His Divinity. Christ died for us, so that we might live forever with Him. This is the hope of Heaven which we celebrate at the Incarnation. God loves us. God saves us, and we are able to accept that salvation, and encourage others to do so. This is Good News, for all the world. It is why we can say with St Paul, ‘Rejoice in the Lord always; again I will say, Rejoice.’ (Phil 4:4 ESV) We can rejoice because in Christ we are offered salvation. We do not deserve it, because we sin, which separates us from God and each other. And yet God is both just and merciful: we deserve to be punished, but God redeems humanity through His Son. This is the mystery of our redemption, that God demonstrates His love for us. ‘For God so loved the world, that he gave his only Son, that whoever believes in him should not perish but have eternal life. For God did not send his Son into the world to condemn the world, but in order that the world might be saved through him.’ (Jn 3:16-17 ESV) If we believe in Jesus, if we trust Him, then we can be saved. In our baptism we share in His Death and resurrection. In the Eucharist we are given a pledge of His love, we eat His Body and drink His Blood, so that He may transform us. Such is the mystery of God’s love for us, which is why we follow Christ’s command to DO THIS. It reminds us day by day, and week by week that God loves us. God loves us. If I preach nothing else, know that we are loved by God, and that His love has the power to transform us, you and me, and the entire world, if we would only let Him. The world is sick and hungry, and the remedy is Jesus Christ, who came as a baby in Bethlehem, and who will come again as our Saviour and our Judge, a Judge who offers us pardon and peace, a peace which surpasses all understanding. ‘And we, what shall we do?’ (Luke 3:14 ESV) John the Baptist is clear, be honest, don’t be greedy, don’t sin. Instead be loving and generous: put that love into practice in your lives and live out your faith. We have in Christ an example of how God has been generous towards us, so we are called to be generous in return. We are called to be a generous and forgiving church, a place of healing and reconciliation, which manifests God’s love to the world, and offers salvation to all who turn to Christ. ‘And I will save the lame and gather the outcast, and I will change their shame into praise and renown in all the earth.’ (Zephaniah 3:19 ESV) God longs to heal the lameness of our sin, to take outcast humanity and gather it into the feast of the Kingdom, to clothe us in a garment of praise and thanksgiving, which is the garment of our Baptism, when we put on Christ. He longs to feed us with Himself, so that we might be nourished by Him, and have life in Him, healed by Him, and given the promise of eternal life. This is the hope which Advent brings, and it is the cause of our JOY. Christians are joyful because we know what God has done for us, and He is the source of our joy. We can trust Him, and His joy is everlasting. Unlike the things of this world, which are fleeting, and do not last, God’s joy, His love, and His faithfulness are everlasting. We know this through Christ, who came that we might have joy, and have it to the full: ‘As the Father has loved me, so have I loved you. Abide in my love. If you keep my commandments, you will abide in my love, just as I have kept my Father’s commandments and abide in his love. These things I have spoken to you, that my joy may be in you, and that your joy may be full.’ (Jn 15:9-11 ESV) This Advent let us listen to what Jesus says, and do it, following His commandments, living out our faith in our lives, and encourage others so to do. So that that the world may come to believe and give glory to God the Father, God the Son, and God the Holy Spirit, to whom be ascribed as is most right and just, all might, majesty, glory, dominion, and power, now and forever. Ours is a world which is characterised by FEAR: it is everywhere. We are afraid concerning Britain’s exit from the European Union, how our climate will change in the future, at the state of global politics and whether there will be another World War, a nuclear cataclysm, or a global pandemic. In short we know that all is not right with the world. We’re not entirely sure what to do about it, but we know that something is wrong. This situation is not unlike that faced by the people of Israel in exile, as addressed by the prophet Jeremiah. They have turned away from the Lord, and worshipped false gods and seen their land destroyed and captured, and been driven into exile in Babylon. And yet there is hope. God has not abandoned his people, but gives them a promise of healing, and of a bright future. The people will return weeping, sorry for their sins, and looking for God’s compassion and forgiveness. As then, so now. At this time of year we give thanks to God for another harvest being safely gathered in, we give thanks for all those who work, so that we might have food to eat, and things to drink. We also need to say sorry for the way in which we treat God’s Creation, the world in which we live: that we are not always good stewards, that we pollute the world, that we live in a world which produces enough food and yet people are hungry. We need to share what we have, so that all may be fed. This is how God wants us to live, and the greatest harvest we can offer is the harvest of our souls living lives of love, kindness and generosity. On the way out of Jericho in the Gospel this morning we have a deeply instructive picture. Bartimaeus is sitting by the roadside, a blind beggar, unable to work, a man who has to rely upon the charity of others to live. He hears a commotion, and asks who is coming by. He is told that it is Jesus of Nazareth, so he cries out, ‘Jesus, Son of David, have mercy on me!’ In his words he does two things: he recognises who Jesus is, that Jesus is the Messiah, the one who will save Israel, the one spoken of by the prophets; and he asks for mercy, for God’s forgiveness and compassion. The people around him tell him to be quiet, he’s an embarrassment, he’s making a fuss! But he cries out all the more, he won’t be silent, he is not afraid to make a scene. Jesus asks them to call him. At which point the attitude of the crowd changes, and they tell Bartimaeus, ‘Cheer up, Get up, he’s calling you.’ Jesus asks Bartimaeus, ‘What do you want me to do for you?’ He asks to recover his sight, so Jesus says, ‘Go on your way, your faith has made you well.’ His sight is restored, and Bartimaeus follows Jesus along the road. The first followers of Jesus were known as followers of the Way, (Acts 9:2) and this is what Bartimaeus becomes: he follows him on the way, both literally and metaphorically. He trusts Jesus, he has faith in Him, and he follows Him. In Mark’s Gospel the story of Bartimaeus acts as a bridge between the teaching and miracles of Jesus’ ministry in Galilee and his time in Jerusalem which leads up to His death. He will enter Jerusalem on a donkey, as the Messiah, and will teach the people of Jerusalem how to follow God, fulfilling the hope and expectation of the prophets. Bartimaeus has faith which allows him to see, whereas the people of Jerusalem cannot see that Jesus is the Messiah, they are blind, whereas Bartimaeus can see, and follows Jesus on the Way. It is a way which will lead to Jesus’ death on the Cross, where He offers Himself as a sacrifice for the sins of the whole world. It is through this that God’s promise of healing first made through the prophets can be put into effect. Because God has done this we can be healed and restored, and we are able to say, ‘sorry’ and ‘thank you’. We are able to celebrate a harvest, knowing that the greatest harvest we can offer God is the harvest of souls, like Bartimaeus, who have faith, and who follow Jesus on the Way. We all long to be on the path that leads to God, a God who saves us, who loves us, who heals and restores us. As it says in John’s Gospel ‘I am the light of the world, whoever follows me will not walk in darkness but will have the light of life.’ If we walk with the eyes of faith we will be on a straight path, to the one who heals and restores humanity. All the world needs to cry, ‘Jesus, son of God have mercy on me’. We need to know our need of God, we need to be healed and restored by him, like Bartimaeus. The world needs this to be fully alive in God, to turn away from sin and the ways of the world: living for others rather than ourselves, loving God and our neighbour. We should remember what Jesus said earlier in Mark’s Gospel (Mk 2:17) ‘Those who are well have no need of a physician, but those who are sick. I came not to call the righteous, but sinners.’ Christ came on our behalf, to bind up our wounds, to call us to follow Him. The sin which mars God’s image in us, which separates us from God, which stops us from being what we can be, is borne by Jesus on the Cross. He binds our wounds by bearing the mark of nails, he heals us with the stream of his blood which flows on Calvary. By his stripes we are healed. We are healed by him so that we may see clearly and travel along the path of faith. It is a straight path on which we should not stumble, journeying with our wounded healer, to live out our faith in our lives as those healed and called by Christ and made part of his body, the church, healed by his sacraments, fed by his word and his Body and Blood, to be strengthened on our journey of faith, it is why we are here today, to be fed by him and with him, that our wounds may be healed. We are all of us sinners in need of the love and mercy of him who bled for us on Calvary and who rose again for us, that we might share new life in him. Let us be fed by him, restored and healed by him, to have life in all its fullness. For we follow the one who heals us not out of blind obedience or fear but through joy, the joy of being free and truly alive in Christ. So let us live that life and give glory to God the Father, God the Son, and God the Holy Ghost, to whom be ascribed as is most right and just, all might, majesty, glory dominion, and power, now and forever. Life can be complicated, it requires us to make choices, which have effects: they define what we become, who we are. Our actions have consequences. In this morning’s first reading from the Book of Joshua, the people of Israel have a choice to make: do they want to worship the God of Israel, or other gods. Joshua is clear: he and his household will serve the Lord. The people of Israel follow his example, they make a commitment to worship God, and Him alone. They make a promise to be faithful. They will, in time break it, at which point they are punished, though God is forgiving. It is a question of commitment, which involves love and sacrifice — the two go hand in hand. It is what marriage is all about, and it also describes God’s relationship with us, and ours with God. It will see Jesus die on the Cross for us, to show us just how much God loves us, and wants to restore our relationship with Him, and each other. It is wonderful , but it isn’t something God forces us into: we are free to accept it, or to refuse it. It is a free gift. In the Gospel Jesus tells the worshippers that He is the living bread, and if they eat Him they will have eternal life. These are bold claims to make. They would have been quite extraordinary two thousand years ago, and they still are today. What Jesus is promising goes against everything which they know and understand about their faith. He calls them to do the unthinkable. At that time they caused people to stop following Jesus. They could not cope with the realism of the Eucharistic discourse in John Ch. 6. Thus, is it hardly surprising that His disciples reply, ‘This teaching is difficult, who can accept it’. That is a normal reaction. But it is not one which Jesus will leave unchallenged. As he is the living bread which came down from Heaven so He will go back. After His death and Resurrection, He will ascend to the Father. Our being fed with the Lord’s Body and Blood is important, and what It is is clearly linked with who He is: God, born for us, who gives himself for us. It is linked to the proclamation of the Gospel, the Good News – the words are Spirit and Life – and God gives himself so that His Church may be nourished by Word and Sacrament. It is sad to think that even then ‘many of his disciples turned back and no longer went about with him.’ Jesus had said something difficult, something troubling, something which turned the accepted order on it its head. People were unable or unwilling to accept what Jesus asked of them, and so He turns to his disciples and asks them if they want to go away too. Peter the leader of the disciples is the first one to reply, ‘Lord, to whom can we go? You have the words of eternal life. We have come to believe and know that you are the Holy One of God.’ (Jn 6:68-69 NRSV). Here Peter is confessing that Jesus is the Christ, the Messiah, the Son of God. To be a Christian is to make the same confession as Peter, and to have the same hope of eternal life in and through Jesus Christ. The teaching is hard to accept, difficult to understand, but we can EXPERIENCE it, when we receive Holy Communion. For Peter, and for us, BELIEF precedes KNOWLEDGE. We believe and then we come to know. And like St Peter we can say, ‘To whom can we go?’ Who else offers us this? No-one, other than Jesus Christ; He alone can save us. He alone can offer us the fullness of life. People often think that wealth or fame can make us happy, and this may be true for a while, but such pleasure is fleeting and transitory. It vanishes like a puff of smoke. Only in Jesus can we know true freedom, and everlasting life. When we gather together as Christians on a Sunday morning we, like Saint Peter, publicly declare our faith in who Jesus is, and what He does. This may not seem a radical act to us. However in the Roman Empire people were expected to worship the emperor as a living God. The thought of burning incense in front of a picture of Queen Elizabeth II would strike us now as not only strange, but wrong, and idolatrous. We worship God, and God alone. And for doing so, countless Christians have been killed over the past two thousand years, and continue to be even today. We come so that we may hear the words of eternal life, the Good News of Jesus Christ, and so that we may be fed by Him, and fed with Him, with the Body and Blood of Christ, so that we can live forever because of Him. We can have a foretaste of the Heavenly banquet of the Kingdom, here and now, we can be fed with Jesus so that we can be transformed more and more into His likeness and prepared, here and now, for eternal life with God, and that we start living that life here and now, so that our faith is not simply a personal or a private matter but one which affects who and what we are, and how we live our lives, so that our faith affects who and what we are, and what we do, so that the Eucharist is our bread for the journey of faith, so that strengthened by Christ and with Christ, we may live lives which proclaim the Good News of the Kingdom. This is how are supposed to live together as a Christian community, living in love, fed with love itself, here in the Eucharist, where we thank God for His love of us. As children of God, loved by God, we are to imitate him, we are to live after the pattern of Christ, who offered himself, who was a sacrifice who has restored our relationship with God. Jesus has come to give us hope through the Eucharist, and the promise of eternal life in and through Him. He does this to show us that God LOVES us, to the extent that he died for love of us. He gives Himself so that we might live in and through Him. Let us be filled with that love, and share it with others so that all may have life in and through Christ. Amen. When the Church talks about calling, it often refers to the call of Isaiah, and Isaiah’s response, ‘Here am I! Send me.’ (Isa 6:8) and while it is good to respond to God’s call in our lives, I suspect that far more people, myself included, feel a lot more like the prophet Amos in this morning’s first reading: ‘I was no prophet, nor a prophet’s son, but I was a herdsman and a dresser of sycamore figs. But the Lord took me from following the flock, and the Lord said to me, “Go, prophesy to my people Israel.” Now therefore hear the word of the Lord.’ (Amos 7:14-16 ESV). Ours then is a not a God who calls the qualified, but who qualifies those called. We may well feel unworthy, or unable to carry out what God wants, and that is fine. God works through us, not because we are capable, but because we rely on Him. Amos tells the uncomfortable truth to the priest and to the king of Israel, and reminds them that their actions have consequences. The plumb line is true, it is a mark of the uprightness that God expects of Israel, the standard of the Law, the Torah. They have fallen short, and will be judged. This is what prophets do, they call people back to God, to walk in His ways. It is what John the Baptist has done to Herod Antipas in this morning’s Gospel: he has married his brother’s wife, Herodias, while his brother is still alive. Leviticus 18:16 prohibits this, so Herod has broken God’s moral law, he has sinned. John has preached a message of repentance, to turn away from sinful behaviour, and to turn back to God. It doesn’t make for easy listening, especially when we know that we have all fallen short of what God expects from us. While Herod wants to listen to John, he is WEAK, he doesn’t want to lose face and acquiesces to Salome’s demand. Rather like John the Baptist, each of us, through our baptism, is called to bear witness to our faith in our lives. This is what martyrdom is, bearing witness, regardless of the cost. We are called by God to be an example and to live out our faith in our lives. In our baptism we put on Christ, we are conformed to him, as priest, when we pray, as king, when we serve, and prophet, when we proclaim His Kingdom. Our prayer, service, and proclamation are the ways in which we live out our faith as something real in our lives, something which Paul’s Letter to the Ephesians reminds us that we do for the glory of God, whatever the cost. Few of us nowadays here in the UK are likely to bear witness to our faith at the cost of our life. Around the world plenty of Christians are, because they value Christ more than anything in this world, even life itself. Nothing is more important or valuable than Jesus Christ, the Word made flesh, who comes to us in His Word, the bible, and under the outward forms of bread and wine in the Eucharist, to feed us, and to transform us more and more into His likeness. When Jesus’ preaching comes to the ear of Herod he thinks that John has been raised from the dead. This anticipates and points forward to the Resurrection when Jesus will rise from the dead. Jesus and John are proclaiming the same message: Repent of your sins, and turn back to and believe in God. They both do marvellous things because they are both filled with the Holy Spirit. What they are, and what they do, is exactly what the church, you and me are called to, the same message, the same proclamation, the same miracles. If we trust in the God who loves us, then God can and will do wonderful things with and through us. Herod doesn’t want to kill John, his conscience is pricked, he knows that he has done wrong. He is in a position where he does not want to risk losing face, in a culture where honour and shame are still motivating factors this is understandable, even if it doesn’t make it right. So Herod gives in to Salome’s wishes, and John pays the price of telling truth to power. Are we willing to do the same? We do so as heralds of the Kingdom of God which is still becoming a reality in the world around us, it is a work in progress until Christ comes again and renews all things in Himself. In the meantime we can rest secure that we are a part of God’s plan for the world, a plan of LOVE, which sees Jesus die upon the Cross for our sins, and rise again to give us the hope of heaven. The redemption of the world in and through Jesus Christ is a reality, one which will become visible and present upon the altar this morning, where we obey His command to ‘Do this in memory of Him’ Christs’s sacrifice upon the cross is made present to us, so that we can share in His Risen Life, and the glory of Heaven here and now. We have a foretaste of heavenly glory to strengthen us on our journey of faith. We have hope for the future because of what God has done for us, and we have a pledge of it here this morning, in Christ’s Body and Blood. So how are we going to respond to the amazing generosity of God? Are we content to say, ‘Thank you very much!’ and carry on regardless as though none of this matters? Are we content for religion to be a matter of private devotion, rather than the core of our being, who we really are, the centre of our lives? Are we so conformed to the world that we act as though God is not important? If God can do such amazing things for us, can we not do more for God? It’s hard, we can all do better, and try harder; our lives are pressured, but that is why we are a Christian community. We do things together: we support each other, both in prayer and action, we cannot do it on our own, we can only do it TOGETHER, by the grace of God, working in and through us. It is His church, of which we are members, called to love and serve Him. God provides all that we could ever want or need with regard to faith, hope, and love. If we trust Him and rely upon Him alone then we can bear witness so that the world will come to believe in God the Father, God the Son, and God the Holy Spirit, to whom be ascribed as is most right and just all might, majesty, glory, dominion, and power, now and forever. Appearances can be deceptive, things are not always what they seem. Much of what we do in church is much more than it seems, what can seem simple and straightforward is, in fact, much more complex. The simple pouring of water in Baptism, or the taking of Bread and Wine in the Eucharist, seem simple enough, and yet through them God is at work in our world, doing wonderful things, pouring out His Grace and His Love on us, to make us Holy. Our first reading this morning reminds us that it is not always comfortable or easy listening to a prophet — we have to hear uncomfortable truth. Prophets call us to repent from sin and turn back to God a call which lies at the heart of Christian Baptism It is identical with the message preached by John the Baptist, and Jesus, and the church exists to proclaim the same message, and to call people to be Holy, to live like saints here and now, and encourage others so to do. In this morning’s epistle we hear the words of the Risen Lord Jesus to Paul, ‘My grace is sufficient for you, for my power is made perfect in weakness.’ (2Cor 12:9 ESV) They are wonderful words of encouragement, because first and foremost they remind us that it’s not about WE can do, but about what God can do in and through us. This is possibly the most important lesson we can learn as a Christian — we cannot earn our way to heaven, God does that for us, through His Son Jesus Christ, who dies on the Cross to give us life in and through Him. What greater demonstration could there be of weakness than in dying the death of a common criminal. God shows the world that power can paradoxically be demonstrated in abject weakness. As Christians we celebrate something shameful in the eyes of the world, because it is in fact the demonstration of God’s LOVE for us. God enters the world in the Incarnation as a weak baby, utterly dependant upon the Holy Family, Mary and Joseph, and dies rejected, and abandoned, a laughing stock, a complete failure in the eyes of the world, and yet it sets us free, it gives us life through His death, power made perfect in weakness. God does wonderful things through Paul, who was once an enemy of the church, no-one is beyond the reach of God’s love and he can do wonderful things through us, if we let Him. The Christian life starts with Baptism, which is how we enter the church and we are filled with the grace of God, and prepared for the life of faith. It is the start of a process which should lead to heaven: by growing in faith, and being fed by Christ, with Christ, in Word and Sacrament; through prayer, and good works, where faith is lived out in our lives.It sounds simple enough, but it is actually difficult, it requires the love and support of a family, and that wider family we call the church, so that we can all support each other in living the Christian life together. In this morning’s gospel people misread Jesus, they fail to recognize who or what he is, they are amazed and in doubting Jesus they doubt God to be at work in the world. We need to believe that God can and will be at work, in and through us. They can only see Jesus in terms of the members of his earthly family. It’s understandable, I can remember going back to the church where I grew up to preach and celebrate for their patronal festival, I was worried how people who had known me all my life would react, would they see a small boy in shorts and spectacles. I needn’t have worried, they saw a priest and were thrilled to see me at the altar. Therein lies the difference, the people of Nazareth see Jesus and can only think, ‘carpenter’s son’. They cannot recognize the Messiah in their midst. We need to know who and what Jesus is. The world around us rejects Jesus, rather like the people of Nazareth, or fail to accept him as true God and true man. They doubt who he was, what he did, and what he said. But we are different, we are here because we do not. We can tell people about him, but unless they WANT to believe then they won’t, no amount of forcing will make them. If, however, they see Christians living out their faith in an attractive way, then all things are possible. Jesus sends the disciples out in pairs, not alone: their ministry is rooted in co-operation, working together to build up the Kingdom of God. The twelve travel light, and are utterly dependant upon God and the charity and goodwill of others. It looks radical, and it is. They proclaim the need for repentance, turn away from sin and the ways of the world, and to turn back to God. They display the healing of the Kingdom: ours is a God who longs to heal our wounds, to restore us, and offer us a radical alternative to the ways of the world. The church is a revolutionary organisation, which seeks to change the world one soul at a time, so that humanity is transformed more and more into the likeness of the God who loves them, into the likeness of Jesus Christ, who lived among us and died for us, through the power of the Holy Spirit. It may sound crazy, but that is what we have been doing for nearly two thousand years, and will carry on doing until Jesus comes again. We continue to offer new life in Christ through baptism, and to feed God’s people with the Body and Blood of Christ, so that they may have life in and through Christ, nourished by Christ and fed with Christ, to be transformed more and more into His likeness so that they and all creation may give glory to God the Father, God the Son, and God the Holy Spirit, to whom be ascribed as is most right and just all might, majesty, glory, dominion, and power, now and forever. While I like gardening, I don’t do enough of it in practice, I’m sometimes forgetful, and not fond of weeding. There is, however, something wonderful about taking seeds or cuttings and placing them in compost and watching them grow. It never ceases to give me a thrill. Once they have grown you end up with something that you can eat, smell, look at, or even sell: it is a source of joy, of nourishment of body and soul. It is an image used by the prophet Ezekiel this morning to look forward to a future where God’s people are sheltered, it looks to a Messianic future, to one fulfilled by the church, as the Lord plants the twig on the lofty mountain of Calvary. The Cross is our only hope, it is the Tree of Life, through which we have life, and all people can rest secure. 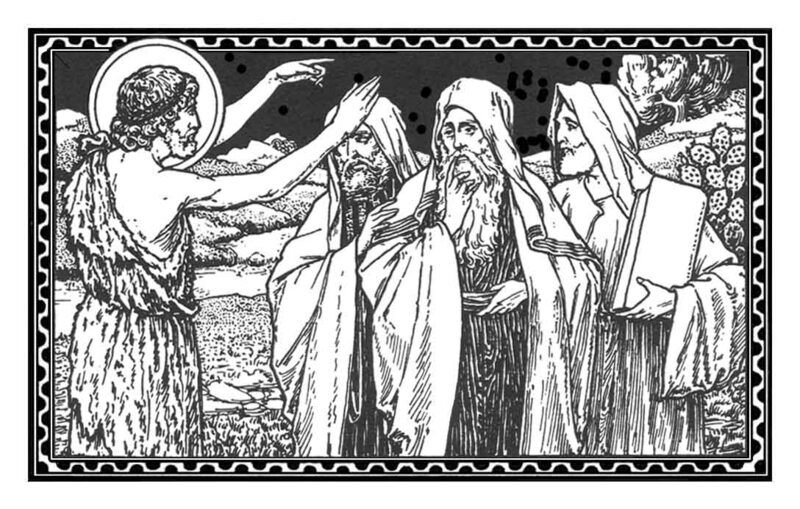 Ezekiel’s image is used by Jesus in the parable of the Mustard Seed to show people how his prophecy is being brought about in and through Jesus, the Messiah. This is the promised Kingdom of God, becoming a reality in and through Christ. We in the West live in an age of anxiety, where we are all worried: what are we doing? Are we doing the right thing? Could we or should we do something different, something more? The Church is in a mess, numbers are falling, what are we going to do about it? Perhaps rather than worrying, we might pause for a second to consider that people have noticed a downward trend in Christian belief and practice over the last two hundred years. It is not something new, but it is complex and long-standing, and cannot be easily reversed. But it is God’s church, and God calls us to be faithful, and to trust in Him. In the parable of the Kingdom with which this morning’s Gospel (Mk 4:26-34) starts, the one who scatters the seed does not know how things grow, and for all their sleeping and rising they cannot influence matters, they just have to sit back and let something mysterious and wonderful happen. That is how God works. The church founded by Our Lord and Saviour Jesus Christ and entrusted to his apostles began as a small affair, just a few people in a backwater of the Roman Empire, written off as deluded followers of another charismatic prophet. It isn’t an auspicious start; it isn’t what a management consultant would tell you to do. But a small group of people had their lives turned around by God, and told people about it, and risked everything, including their own lives to do so. The Church has now grown to point where there are several billion Christians on earth. Here in the West the picture may currently look rather bleak, but the global picture is far more encouraging, people are coming to know Christ, to love Him, and serve Him. And even if we have been going through some bad harvests over here, the trick is to keep scattering the seed as they will grow in a way which can defy our expectations. It is after all God’s Church not ours. Jesus compares the Kingdom of God to a mustard seed, a small thing, only two millimetres in diameter, and yet in the Mediterranean climate it could grow into a bush as large as 3’ x 12’. It has a small beginning, but there is the possibility of remarkable growth, and the image of birds nesting in its shade signals divine blessings (cf. Judg 9:8-15, Ps 91:1-2, Ezek 17:22-24) Jesus is taking the imagery of Ezekiel and showing how it will be brought to fulfilment in and through the Church. Such is the generous nature of God, that we have somewhere where we can we can be safe, and where we can grow in faith. Such is Divine Providence that God gives us the Church as means of grace, so that humanity may be saved. Through the saving death of His Son on the Cross, we can be assured of salvation in and through Him, a sacrifice which will be made present here this morning in the Eucharist, where Christ feeds us, His people, with His Body and Blood, to nourish and strengthen us. And so in the Church we live for Christ — our thoughts, words, and actions proclaim the saving truth of God’s love for humanity. If we seek God’s forgiveness and the forgiveness of others, and are forgiving ourselves then we can be built up in love. If we are devout in prayer, nourished by the word of God, and by the Sacrament of his Body and Blood we are built up in love, our souls are nourished and we can grow into the full stature of Christ. So let us come to Him, and be fed by Him, healed and restored by Him, living in love and encouraging others so to do, for the glory of God and the building up of His Kingdom. If we are faithful, if we keep scattering seed in our thoughts, our words, and our actions, then wonderful things will happen. We have to trust God to be at work in people’s lives, and be there for them when they do respond. If we can be as welcoming as the Mustard Tree then we will have ensured that people have a place where they can come to know Jesus, and grow in love and faith. The trick is not to lose heart, but to trust in the God who loves us, who gave His Son to die for love of us. If we are confident of who Christ is, and what He has done for us, then as people filled with the love of God, we will carry on the Church’s mission of proclaiming the Good News of the Kingdom of God, and people will come to know and trust that love which changes everything, and give glory to God the Father, God the Son, and God the Holy Spirit, to whom be ascribed as is most right and just all might, majesty, glory, dominion, and power, now and forever. One would naturally assume that Jesus’ friends and relatives would the people closest to Him, and you would be wrong. This morning’s Gospel shows us how they get the wrong end of the stick: they think he’s crazy, and they want Him to stop healing people and telling them about the Kingdom of God. At one level they are right, it is a crazy thing to do, but it is also wonderful, not what the world wants, but what it needs: wounds are healed, relationships restored, and we can begin to live as God wants us to. Jesus friends and relations do have a point: they want Him to stop, to eat, to rest, as up to this point in Mark’s Gospel we have seen frenetic activity, there is a breathless quality to the account. But they can only see practical concerns and fail to notice the importance of what is going on in His public ministry. The religious authorities are not on Jesus’ charismatic healing ministry — they accuse him of being possessed by an evil spirit, whereas what He is doing is proclaiming in word and deed the power of God to heal, and to free people from the power of evil, something Jesus will demonstrate finally upon the Cross. Jesus points out the inconsistency in the charges laid against Him, if He is possessed by the Devil, how can he cast the Devil out? His accusers have failed to see the spirit of God, the Holy Spirit, at work in Him. Their refusal to see God at work is a sign of their pride and hardness of heart — they cannot discern the works of God, and write of as evil a wondrous demonstration of God’s love for humanity. Such is the Sin against the Holy Spirit, a wilful rejection of God. While Jesus’ dismissal of His relatives appears harsh and uncaring, He is making a wider point about the nature of the Society which Christianity seeks to bring about. In a world where kin, and family relationships mattered where they defined who and what you were, something radically different is offered. What matters is not who your parents and siblings are, but that you have through Christ entered into a new relationship with God, and other believers. We are brothers and sisters in Christ through our baptism, and because we do the will of God: we love God, and love our neighbour. We do what God wants us to do, and we live out our faith in our lives, but how do we know what the will of God is? In his letter to the Romans, Paul writes, ’Do not be conformed to this world but be transformed by the renewal of your mind, that you may prove what is the will of God, what is good and acceptable and perfect.’ (Rom 12:2). So we are in the world, but not of it, we are opposed to the ways of the world, we march to the beat of a different drum. This sounds easy, but in fact it is very difficult. The world around us, our friends, even our family, will put pressure on us to go along with worldly ways: ‘You don’t have to go to church every Sunday, come shopping instead, I’ll buy you lunch.’ It is easy to give in to such things, I know, I have, from time to time. It is tempting, and easy to give in, but over time we lose the habit and drift away. ‘For you know what instructions we gave you through the Lord Jesus. For this is the will of God, your sanctification: that you abstain from sexual immorality; that each one of you know how to control his own body in holiness and honour,’ (1Thess 4:2-4). It is not, however, advice on what not to do. There are positives as well: ‘pray constantly, give thanks in all circumstances; for this is the will of God in Christ Jesus for you. Do not quench the Spirit,’ (1Thess 5:17-19). Prayer is one of the key ways we can be close to God, and know His will. if we combine this with reading Holy Scripture and the regular reception of the Eucharist then we are on the right track. Through Christ we are in a new relationship with each other: as the Church we are part of a family, together with billions of Christians across both space and time, we share our baptism, and we are nourished by Word and Sacrament, in the Eucharist, which makes us the holy people of God. We are made a family together in Christ, with Christ, and through Christ. This is what Christ came to be, reconciling people to God and each other. As he says, ‘I came that they may have life, and have it abundantly.’ (Jn 10:10 RSVCE) We share that life together in the Church. It keeps us close to Christ and to each other, and helps us grow in holiness. That’s all well and good in theory, but in practice we come up against the problem outlined in our first reading from Genesis: we make a mess of things, and don’t do what God wants us to. That’s why Jesus came among us, and died upon the Cross, where He bears the weight of all the sins of humanity, past, present, and future. God can and does sort things out, in Christ. Confident of our faith in Jesus Christ, we can echo the words of St Paul in this morning’s Epistle, ‘knowing that he who raised the Lord Jesus will raise us also with Jesus and bring us with you into his presence.’ (2Cor 4:14 RSVCE).It’s why we celebrate Easter in particular, and Sundays in General: the day Christ rose from the dead, the first day of the week, the eighth day, the New Creation. We have the same hope as Paul because of what Christ has done for us. It is all about GRACE, the unmerited kindness of God, which we desire, but do not deserve. We cannot work for it, it comes because of the generous love of God, His loving kindness. Paul can look to a heavenly future where the trials of this life are past, where we live for ever in the presence of God, and are filled with His glory. This is our hope as Christians, through what Christ has done for us, to fill us with His love and His life. Here this morning, in the Eucharist, at the Altar, Christ will give Himself for us, His Body and His Blood, so that we can feed on Him, be fed by Him, and be fed with Him, so that our souls can be healed. What greater medicine could there be for us, than God’s very self? What gift more precious or more wonderful? Our soul’s true food. We eat Christ’s Body and drink His Blood so that we might share His Divine life, that we might be given a foretaste of Heaven here on earth. As Christians we worship One God, Father, Son, and Holy Spirit: they are not three Gods, but one God. That the three persons of the Trinity are one God is itself a mystery. The mystery of God’s very self: a Trinity of Persons, consubstantial, co-equal and co-eternal. We know God most fully in the person of Jesus Christ, the Incarnate Word of God, born of the Virgin Mary, who died upon the Cross for our sins, and was raised to New Life at Easter, who sent the Holy Spirit at Pentecost. In Christ God discloses who and what he is, we know Him as someone who pours out LOVE, who is interested in reconciliation. We celebrate the Feast of the Holy Trinity today because in 1334 Pope John XXII decided that on the Sunday after Pentecost the Western Church would celebrate the mystery of the Trinity. It was already a popular feast, and had been kept in some form since the triumph of Orthodoxy over the followers of Arius in the 4th century. Nearly two hundred years before the Pope ordered that the feast be kept by the Universal Church, Thomas Becket was consecrated a bishop on this day, and kept the feast. Its popularity in the British Isles is shown by the fact that in the Prayerbook we number the Sundays between now and Advent not ‘after Pentecost’ but ‘after Trinity’. It defines the majority of the liturgical year for us. This morning, at the very beginning of our service, the following words were said, ‘In the name of the Father, and of the Son, and of the Holy Spirit.’ We said, ‘Amen’ to signify our assent and many Christians make the sign of the Cross as the words are said. At the end of the Eucharist I, as a priest, will pray that God will bless you as I invoke the name of the Trinity and make the sign of the Cross. These words and gestures are not random, or the result of a whim, but are part of our tradition of worship as Christians. This is how we express and declare our faith in God the Father, Son, and Holy Spirit; through our words and actions. We say these words because they express our faith.These help us to reinforce what we believe and help us to live out our faith.We make the sign of the Cross, the thing that saves us, the centre of our faith. In this morning’s Gospel we see Jesus’ encounter with Nicodemus, and after a discussion of baptism, and the new life which God in Christ offers Jesus says, ‘And as Moses lifted up the Serpent in the wilderness so must the Son of Man be lifted up, that whoever believes in him may have eternal life’ (Jn 3:14-15 ESV). Jesus refers to an incident in the Book of Numbers: ‘Then the Lord sent fiery serpents among the people, and they bit the people, so that many people of Israel died. And the people came to Moses and said, “We have sinned, for we have spoken against the Lord and against you. Pray to the Lord, that he take away the serpents from us.” So Moses prayed for the people. And the Lord said to Moses, “Make a fiery serpent and set it on a pole, and everyone who is bitten, when he sees it, shall live.” So Moses made a bronze serpent and set it on a pole. And if a serpent bit anyone, he would look at the bronze serpent and live.’ (Numbers 21:6-9 ESV) Jesus uses this story to help us to understand His coming Crucifixion. It will save whoever believes in Him, it is the supreme demonstration of HOW MUCH God loves us. The Love of God is such that He gave His only Son ‘that whoever believes in him should not perish but have eternal life. For God sent the Son into the world, not to condemn the world, but that the world might be saved through him.’ (Jn 3:16-17 ESV). God does not send Jesus to condemn humanity for its sin, its disobedience, but to save humanity THROUGH LOVE, through selfless, sacrificial, redemptive LOVE: dying for us, bearing the burden of our sin, and reconciling us to God, and each other, making the Kingdom of God a reality, and so that we can have a relationship with God, and each other which is rooted in LOVE, a love which is the very nature of God, how God is. The Love of God sees Jesus take flesh by the power of the Holy Spirit, to be born of the Blessed Virgin Mary, preach repentance and the nearness of the Kingdom of God, and die for us on the Cross. Then he rose again, ascended, sent the Holy Spirit to us at Pentecost, and promised to come again as our Judge. Fellowship, or Communion is what the persons of the Trinity — the Father, the Son and the Holy Spirit — have between each other, and which we the Church are invited to share, with them and each other. It is the imparting of the grace, the undeserved kindness of God, of a God who dies to give us LIFE with Him forever. In the act of Holy Communion we are fed by Christ with the Body and Blood of Christ, so that we might share in the divine life here on earth, and share it with others. We can do this because we have been baptised. In this morning’s Gospel Jesus tells Nicodemus, ‘Truly, truly, I say to you unless one is born of water and the Spirit, he cannot enter the kingdom of God.’ (Jn 3:5 ESV) In our baptism we share in Christ’s death and resurrection, we put on Christ, we are clothed with Him, we become part of His Body, the Church. We are re-born, born again. It is how we enter the Church; how we are saved. It defines us as Christians — we are baptised in the name of the God who saves us, and we are His. Jews, Muslims, Jehovah’s Witnesses, Mormons and others cannot accept the fact that as Christians we say that we do not worship three Gods, but One God. They cannot accept that we believe that the Son is God, not less than the Father, likewise the Holy Spirit, and yet there are not three Gods but one God. These are not manifestations, but persons which share the same divine essence and yet they are distinct. The Father uncreated; the Son begotten; the Spirit proceeding. It is why we stand up and state our beliefs when we worship God. It matters. We do it regardless of the cost. Simply believing the Christian faith and declaring it publicly can lead to imprisonment or death in some countries around the world today. It is a serious business being a Christian, and wonderful, because we follow a God who shows that His very nature is LOVE. We are filled with that love, and share it with others. Our faith matters. It can change lives. It can change the world, one soul at a time. It isn’t simply a private concern, something to be brought out for an hour on a Sunday morning and then hid away politely. It is the most important thing there is. It is something to fill us with joy. It is something that we should share with others, so that they might believe and give glory to God the Father, God the Son, and God the Holy Spirit, to whom be ascribed as is most right and just, all might, majesty, glory, dominion, and power, now and forever. When I was a child I loved reading books. My favourite place in the world was a library, and I can still remember going there one day and my father gave me a bookmark on which the following words were written, ‘Be alert, the world needs all the lerts it can get!’ The pun was a good one, I enjoyed it, and can remember it decades later. It makes a serious point, namely how do prepare to meet Jesus? Advent is a season of preparation, when we prepare to meet Jesus, both as a baby born in Bethlehem, and as our Saviour and Judge, who will come to call the world to account. The world around us sees preparations for Christmas as most concerned with cards, decorations and shopping. The Church sees things somewhat differently. What matters are our souls and our lives: who and what we are, what we do, and why we do it. We, here, this morning, as Christians are living between Christ’s Resurrection and the end of the world. We are to be ready, and to spend our time considering the four last things: death, judgement, heaven, and hell. They await us all, each and every one of us, so how will we prepare for them? In this morning’s gospel, our Lord tells us to stay awake, to be on our guard, to be prepared, because we do not know the time when our Lord will return in glory to judge both the living and the dead. Jesus tells us not to be found asleep, in the sleep of sin. An attitude which says ‘I’m alright’, ‘I don’t need God’. It is this sleep which affects many people, both those who come to church, and the vast majority who do not. That’s not to say they don’t try and live good Christian lives. We all do, instinctively. And yet any mention of the last things tends to conjure up images of ﬁre and damnation, hell and brimstone preachers, thumping pulpits and putting the fear of God into people. Such is the characterisation of the religious as extremists, something increasingly common. Yet, such people have a point – their message is true – but I suspect that they put it across in a way which strikes people as unpalatable, and so they switch off and go to sleep. And yet, what they say matters, it is true and we could all do with being reminded of it. How we live our lives matters, it affects who and what we are, and the world around us. We have but one life to live on Earth, and we must try, with God’s grace, to do the best we can. We live in a world which does not care about such questions, apparently people’s lives are their own business, and we have no business calling people’s actions into question, but this will not do. Our actions affect us, our character, our lives, and the lives of people around us – our actions have consequences, which is why our lives and how we live them matter. What we do and say matters and the Church exists to call people to repentance – to turn around and change the whole of their lives and follow Christ in their thoughts, their words, and their deeds – for the Kingdom of God is close at hand. Lest we get too afraid, we can turn in confidence to the words of Isaiah in our first reading this morning. The prophet is looking forward to the redemption of Israel, the coming of the Messiah, a new future after exile. Against a picture of human sin, and rebellion against God, there is the implicit possibility of something better. In those times when God can seem absent, there is the possibility that God as a loving parent is giving us space and time to reflect and repent. Isaiah is convinced both of the power and the love of God, to remake us, and restore us, to enrich us with his grace, and give us the gifts of his spirit, as Paul wrote to the church in Corinth. We’re not being left alone in all this. God both tells us the nature and source of the problem, and provides us with a solution. He even helps us along our way: he strengthens and encourages us, to turn our lives around, and follow him. That we be vigilant – and take care of the state of our lives and our souls, and those around us, that we are awake, rather than indulging in the self-satisﬁed sleep of sin. For God asks of us – that we, this Advent, turn our own lives around, and prepare ourselves to meet our Lord, at the Eucharist, when he meets us at his altar in His Body and Blood, and in His Words proclaimed in Scripture. We also need to look forward to meeting our Lord in the yearly remembrance of His Nativity, and in his coming in glory as our Saviour and our Judge. If we can look beyond the commercialism of a sad, cynical world, we can see that God was prepared to go to any length to meet us, to be with us and heal us. Can we not prepare ourselves, our souls and our lives to meet Him? Ours is, after all, a God of love and mercy, born as a helpless child in a stable, who gives Himself out of love for us, to suffer and die to restore our relationship with God the Father and each other, who gives us Himself under the outward forms of bread and wine so that we might have life in Him. He sends us His Holy Spirit to strengthen us, so that we can be alert, stay vigilant, and prepare to meet Him. This morning’s Gospel asks us some serious questions: do we love Jesus this much? Would we risk being laughed at or criticised for our extravagance in being like Mary of Bethany and pouring ointment on Jesus? How can we do this for Jesus in our lives? Can we really show him how much we love him, and how much we want to serve him? What might this look like in our lives, and how might we do it together as a Church, to proclaim God’s saving love to the world. As we begin Passiontide we look to the Cross that more radical costly act of generous love, the love of God for us. God does this for us, what are we going to do in return? Are we going to be like Judas and moan about the cost, the extravagance? Do we want to be a penny-pinching miserly church, or do we want to be something else, something which makes the world stop and take notice, which doesn’t make sense, which shows the world that there is another way, and it is the way of the Kingdom. God’s generosity gives his Son to die for us, he feeds us with His Body and Blood so that we might have life in Him. What are we going to do in return?